I haven't blogged for a while for a plenty of reasons, I'm going through a change period in my life and as any change it is not easy. This post will be not informative and will not teach any of my dear readers, anything on Computers its pretty personal but still for my friends it might cause interest. 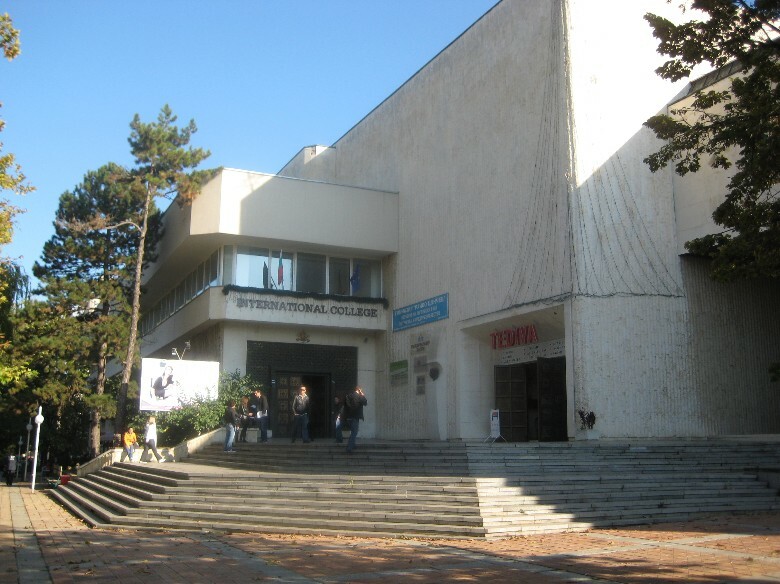 For a while I worked in a International University College situated in my hometown Dobrich. I was hired on position of IT Manager, and actually was doing a bit of E-Marketing to try to boost traffic to College's website – www.vumk.eu and mostly helping the old school hacker ad college system administrator over the last 10 yrs – Ertan to fix a bunch of Linux Mail / SQL and Webservers and some Windows machines. In college I learned from Ertan how to install and backups of restaurants software called BARBEQUE as well as how to fix problems with billing terminals situated in College Restaurant (3rd floor of building). Other of my work time I had to fix infested Windows computers with viruses re-install Windowses and fix various printing and network problems of College's teachers, accountants, cash desk, marketing and rest of college employees. Talking about Ertan I should express my sincere tremendous Thanks (Thanks Ertan) to it for recommending me for this job position. Right before I started work in the college I was jobless for a while starting to get desperate that its impossible find work. Current IUC sysadmin – Mr. Ertan Geldiev is a remarkable man and one of the people that made great impression in my mind. Something I found interesting I can learn from Ertan was to get from his cheerful "admin" attitude. As a true hacker Ertan had this hacker attitude of playfulness I myself has for a while lost over the years. So seeing someone like this near my life make me a good favor and had a positive influence on myself. The college is a great place to be as you have chance to meet plenty of people both lecturers (professors), participate in the various events organized by College's as well as get involved in the many European Projects which are being handled by a European Projects department special department situated on the back of the College Building. Other positive about College is it is small and located on a peaceful town of Dobrich. This gives the bright people a lot of space for personal development, anyways on the other hand it can make you also a bad as Dobrich as a small city is a bit boring. The studies in College are good for students who want personal freedom as there is not too strict requirements for professors on how to teach. Though college had help me grow, especially in my knowledge in Windows 7 and 8 (Ertan had a really good Windows background), I couldn't have the chance to develop myself too further in the long term. So my job offer to work in HP as Web and Middleware Implementation Engineer opened much broader opportunities for my long term IT career. Other reason I quit the College IT job was simply because I needed more money I had the vision to make a family with a girl from Belarus – Svetlana and in order to take care for her I need to earn good money. My official salary in the college was the funny for the position – 640 lv (though after a few months I was promised to have a raise and earn 400 EUR :)) . Such low sallary was for the reason I had the idea to continue studying in College and complete my Bachelor Business degree and we had agreed with the College CEO Mr. Todor Radev to extract part of my salary monthly and with that to pay my 1 semester tuition fee (2200 EUR) – necessary for my graduation assignment. Though completing the Bachelor is important phase to close in my life for a long time, I found for the moment more valuable to work for HP and earn normal living salary with which to possibly finance myself and create family with woman of my life (hopefully) in the short term. In this post I want express my sincere thanks to all people in International College (Elena Urchenko, Krasimir – for helping me in my job duties), Pavel and Silvia for being a colleague for a while I worked partly in the Marketing Department. Talking about Marketing Department what I did there is some Twitter Marketing (building some twitter followers) and wrote a tiny document with recommendation on how to optimize College website – vumk.eu (future version) – for better SEO ranking. 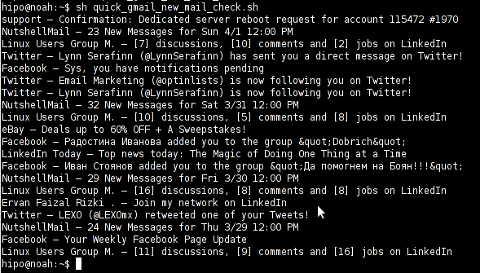 This included complete analysis from user outlook to Indexing bots and site current code. I have to do a big underline on how great person the College President and UNI Rector – Docent Todor Radev is. I have already bitter experience studying for a while in a government universities when younger and I know from experience usually Rectors and Universities management of state universities is pure "Hell". Thanks to Mr. Todor Radev for he did me a big favor letting me quit job just a week later (instead of 1 month as it is officially set by Bulgarian Dismissal Law and explicitly stated in my Work Contract. Also as a person my experience from Docent Radev is wonderful too. He is extremely intelligent, brilliant gentleman and most importantly open minded and always open for innovation. As a close up I would like to say Big Thanks to everyone which I worked with or met in International University College! Thanks guys for all your support and help, thanks for being work mates and friends for the time. Some people might argue me but recently and over the last years, I had thoughts over the so common nowadays problem of constipation. I think constipation is God judgement on our increasingly gluttony self-love instead love for others, ungodliness and our multiple sins. I'm deriving this conclusion from my personal experience with constipation, every-time I over ate forced by my gluttony (partially forced by the over filling from everywhere with marketing to eat), I get constipated. Constipation is one of the worst experience one can get and probably there is no person on earth who didn't experienced this in a stage of his earthly life. Probably half of the world is suffering from this terrible problem at least few times a year, where the frequency of constipation around people tends to be increasing with every consequential year. Most of people from western world countries are in a number of times suffering more compared to less developed countries. Main reason for increased constipation percentage in the western world (in my view) is the bad quality of half-artificually produced vegetables and fruits. Many of which grows as you should know grows in laboratories like places in order to do a cost saving for the companies. Due to the marketing hype and fuzz that took over westerners, many as a trick use the "green product" labeling just to make you convince their product, where in reality the product is far from green. I think, God allowed the poisons which we hold in our hearts to materialize in our food as a punishment for our lack of repentance. The hyper consumption that is ruling over western europe model is trying to spread itself in the less developed countries as well, while maybe a billion of peoples all around the world are on the edge to die from hunger. In the west all businesses are trying to restructure themselves to more green friendly / (more green), whether parallel with that the same 'environment concerned businesses' are stimulating people to over consume through their marketing departments. Tell me isn't that one huge hypocrisy? How comes on one place a company talks about any efficiency if its fruits are inefficiency (over consumption)? In the past days people consumed much less than today and less varied foods, still most of them were more heatlthy and many of them lived to an older age compared to know (this is a fact that one can learn not from the fake company statistics on the internet trying to all the time show that the age barrier is increasing, this can be learned from our grandmothers and grandfathers and a bit of staring into history). "Seed Companies" like Monsanto are already dominating the markets and killing the little farmers, so every next day, less and less of original God blessed plant seeds is left on earth. And even those who still are trying to be individual middle and little farmers are forced to buy already a genetically or hybrid modified seeds so a lot of the grown vegetables or fruits is not grown through God blessed and given original food fondamential but some kind of 'human laboratory altered' plants. Most people and companies doesn't care if the seed is blessed or not by God or what kind of seed or food it is due to the fact they have long ago rejected God and do operate all their life with no God in their mind, but with the only goal for more and more pleasure and self-fulfillment of interests. It is sad really our bodies are constipated but it all starts from our soul constipation, we don't develop our souls in God's knowledge of good but advance instead in the "constipation" of evil. But constipation is not so bad in reality and it can be seen as a blessing from God as all pain makes us re-think over life and our deeds. Thus I believe though many might argue me, Constipation is just another of God's innumerous mercies over man to turn us to repentance and prayer. But I think still there hope as long as each of us tries to be good or develop for good and pray to God, I believe all can be changed our soul and body constipation can be removed through God's power and mercy – only we have to strive for it …. One of the companies, where I'm doing a part time job, as an IT Consultant, System Administrator and Web developer, a e-marketing specialist and business consultant (the list goes on ;)) … planned to integrate a Newsletter support in their WordPress based websites. Earlier I've done something similar as, I've added a subscipriotion (form) box to WordPress to use Google Feedburner RSS . What I needed this time, however was a bit different. The company required the newsletter to be a separate one and don't relay on Google Feedburner (RSS) to deal with the subscriptions . Its really Advanced, probably the best free newsletter for WP available as of time of writting. The plugin supports email subscriber user confirmation (double opt-in), as well as can be accustomized to work with single opt-in. For all those who don't know Double Opt-In is the technical term for a once requested user email (single opt-in), for subscription which is later confirmed by following an email box sent link pointing to confirmation URL. Double Opt-In is almost a standard and "must" as otherwise, many spam bots will fill in randomly email addresses and your subscribers list will be mostly containing spammer email addresses. Newsletter plugin is very configurable but it takes a bit of longer time until it is confingured to work well. So be patient with it. 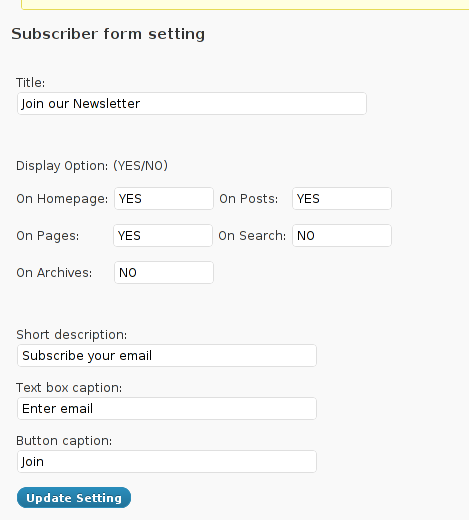 d) Make Newsletter field appear on a wordpress home page. Drag and drop the Newsletter plugin widget to the widget right pane. Put it on the exact place you would like it to appear. I've experienced, this caching problems and it was quite a riddle, until I found out that the Newsletter plugin is not appearing on the WP pages because of the old cache. I've checked bacicly everything (error.log , apache php_error.log) etc.. Therein, there was no error or anything, so after a long 1 hour or so poundering I figured out this kind of caching done by W3 Cache. I don't know, why but this plugin didn't work properly on the wordpress install, I've tested it. Its true the wordpress version where I give it a try was not running, the latest stable wordpress so I assume this might be the reason for the empty pages returned when I enabled the plugin. According to wordpress's plugin – http://wordpress.org/extend/plugins/alo-easymail/, the plugin is marked as Works, however in my case it didn't. This plugin was a real piece of cake, compared to all of the rest, tested this one was the easiest one to install and configure on WordPress. Just like with Newsletter and ALO EasyMail Newsletter once the user is subscribed, from the admin there is possibility to sent crafted messages to all subscribers. The plugin is a great, choice for anyone who is looking for quick install of Newsletter on WordPress without extra "config" complications. Using this plug-in we can send email to all registered folks. Using this plug-in we can send email to all comment posted folks. Check box option available to select/unselect emails from the send mail list. You see in the screenshot, the config where to place the plugin is trivial. 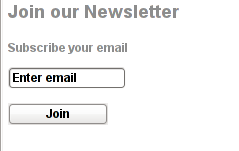 Though Email Newsletter is great, it has one serious drawback, as it doesn't support Double Opt-In. Therefore people subscribing through it are not mailed with a request to confirm their email subscription request. As a result, its very likely many spam-bots submit fake emails in the newsletter subscribe form and in 1 year time your newsletter email list might get full with tens of thousands unexistent emails. If you end up with this bad scenario, once newsletter emails are sent to (regular) exitent subscribers, many of the bulk emails in the list will never reach their senders, but will just fill-up the mail server queue and take up server resources for nothing for one week or so (depending on the email configuration keep undelivered mail setting). Anyways, since the basis of this plugin works fine, I'm sure if the author modifies it to include a simple Captcha instead of double-opt functionality, the plugin can become top plugin. Free Software (FS) is free as in freedom as well as free as in price. Free and Open Source Software (FOSS) is developed by geek hobbyist which voluntarily put their time and effort in writting, testing and sharing with anyone for free million of lines of programming code. This doesn't mean however the price of free software costs is 0 (zero). Though the "end product" – Free Software developed is FREE, "real" software costs as with any other product costs huge money. According to James E. Bromberger – the whole Debian project was estimated to be at the shocking price of $19 billion – $19 000, 000, 000 !!! "By using David A Wheeler’s sloccount tool and average wage of a developer of US$72,533 (using median estimates from Salary.com and PayScale.com for 2011) I summed the individual results to find a total of 419,776,604 source lines of code for the ‘pristine’ upstream sources, in 31 programming languages — including 429 lines of Cobol and 1933 lines of Modula3! In my analysis the projected cost of producing Debian Wheezy in February 2012 is US$19,070,177,727 (AU$17.7B, EUR€14.4B, GBP£12.11B), making each package’s upstream source code worth an average of US$1,112,547.56 (AU$837K) to produce. Impressively, this is all free (of cost). James has done incredible job with this great research and he deserves applause. However I believe the numbers proposed by his research are slightly different if we speak about realistic cost of Debian GNU / Linux. The real costs of the working software ready to install on a user PC are way higher, as according to Jeb's research only the software cost based on code line count is considered. Hence James software estimation calculates only the programming costs and miss many, many factors that constitute the software end cost. This are most of the multiple factors which should probably influence the cost of any non-free (proprietary software) project. No matter this costs apply for non-free software, it perfectly applies for free software as well.With all said if if we assume the non-programming costs are equal to the programming costs of $ 19 000 000 000 (suggested by Jeb). This means the real cost of Debian will presumably be at least $32 000 000 000. Putting $ 19 billion for all this long list of "additional" costs (besides pure source) factors is probably still very under-scored number. Very interesting figure from Jeb's research is the Programming Languages break down by source code figure. As you can imagine all the source evaluation results, are highly biased and are open for discussion, since evaluating a free software project/s is a hard not to say impossible task. The "open" model of development makes a project very hard to track, open source model implies too many unexpected variables missing from the equation for clear calculation on costs. What is sure however if turned in money it is very expensive to produce. At present moment Debian Project is sponsored only through donations. The usual yearly budget 5 years ago for Debian was only $80 000 dollars a year!! You can check Debian Project annual reports throughout the years here , for year 2012 Debian Project budget is as low as $ 222, 677 (US Dollars)! The output price of the software the project provides is enormous high if compared to the low project expenses!